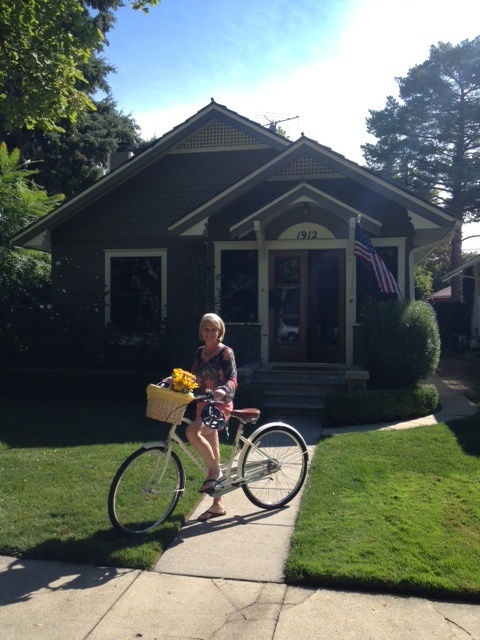 My husband is an avid cyclist. Avid with a capital “A.” Avid as in his idea of a good time is riding his bike 72 miles with 4.2 million feet of elevation climb. Avid as in owning a fleet of bicycles with a combined value of the national debt. Avid as in . . . well, you get the idea. What about that looks fun? No, stop it. That is not a picture of the Wicked Witch of the West. 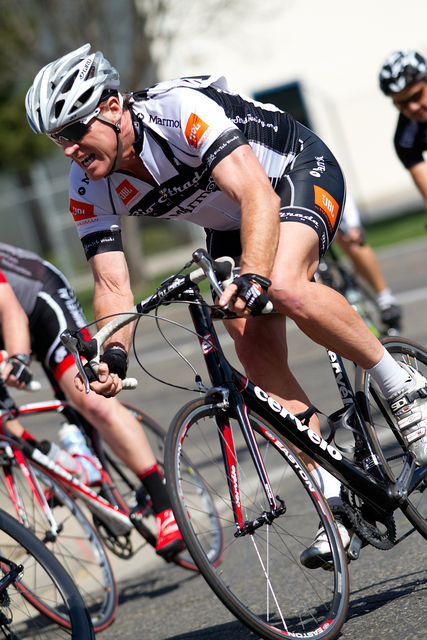 But something was missing in my quest to feel passion for the sport. I couldn’t put my finger on that certain je ne sais quoi until today. I don’t have the right outfit! Now if I could just get my hands on one of these uniforms . . .
Colombian Cycling Team. Who in the world thought that was a good idea? Was the designer on Columbian drugs? IRS Phone Scam ~ Don’t Fall For It! I don’t get some people. Imagine devoting your life’s work and precious time on this earth to scamming people out of their money. How do those people sleep at night? What does their mother think about their career choice? Like I said, I don’t get people. Don’t even get me started on the Ray Rice (aka wife-beater and all-around thug) elevator incident. This rant is about a threatening phone message I picked up today, allegedly from our friends at the IRS. First of all, since when did IRS agents start saying “take care” when they threaten action against a taxpayer? Smelling a rat, I Googled the phone number, and of course, it popped up as a scam on several message boards. One person who commented on the board said he called the number back 25 times in one day just to hassle the scammer! I’d like to meet that guy and shake his hand. You gotta love his pluck. What troubles me most about this scam is there are many people who might fall for it, for example, my 91-year-old dad. A call like that would scare the bejesus out of him and I could see him immediately calling the number back and forking over money. According to an article in the Wall Street Journal, an estimated $5 million has been lost to these scams. Tragic. I will add here, the IRS never initiates contact with taxpayers by phone ~ they always send written correspondence first. This was my public service announcement of the day. Oh and yes, I did file a report to the FTC. You know I don’t like to get up on my high horse. Much. 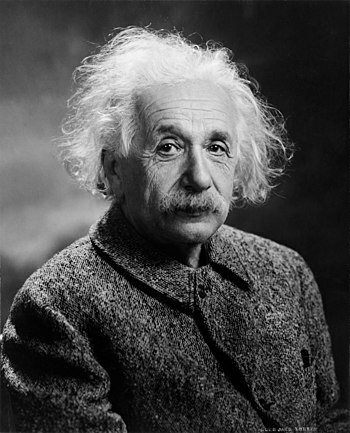 But I am troubled by something so vast, the problem is not likely to go away in our lifetime, or for that matter, during our great-great-great-great grandchildren’s lifetime. There is a floating mass of plastic in the Pacific Ocean that is roughly the twice the size of Texas. TEXAS! For that matter, there are boatloads (no pun intended) of plastic bags, bottle, spoons and whatnots in all of our oceans. And the junk ain’t going anywhere, anytime soon. The plastic just keeps breaking down into smaller and smaller pieces until it is microscopic plastic dust. Marine life unwittingly ingest the stuff. 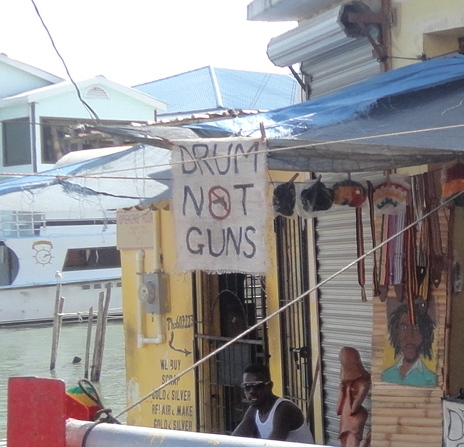 When we were in Belize in March, we witnessed the problem firsthand. Every day at dawn, the resort had a crew of Belizeans rake up the truckload of plastic that had washed up on shore overnight. Talk about job security for those guys. We snorkeled every day in pristine waters. No plastic trash to be seen. However, on one of our trips, something was up with the tide or the vortex of waters and we were right in the thick of swimming through plastic city. It was disconcerting to see a CVS bag float by. Sickening is a better word. According to renowned marine biologist and my new hero, Dr. Sylvia Earle, a whale washed ashore the California coast and the poor guy had 400 pounds of plastic in its stomach. No one wondered why it died. I’m not saying plastic is a bad thing. What we are doing with it is a bad thing. Man is not the only culprit. Mother Nature plays a part when she unleashes tsunamis what sweep tons of debris, including plastic, into the ocean. Those clever scientists who worked tirelessly on the development of the seedless watermelon ought to now focus their energies on how we are going to fix the problem of plastic in the ocean. I won’t load you up with statistics and sad facts here. All you need to do it consult Mr. Google and search for “plastic in the ocean.” Reading up on the issue will keep you busy and off the streets for days. I do, however, urge you to watch this brief video on Plastic Ocean’s website. Okay. I’m off my soapbox. 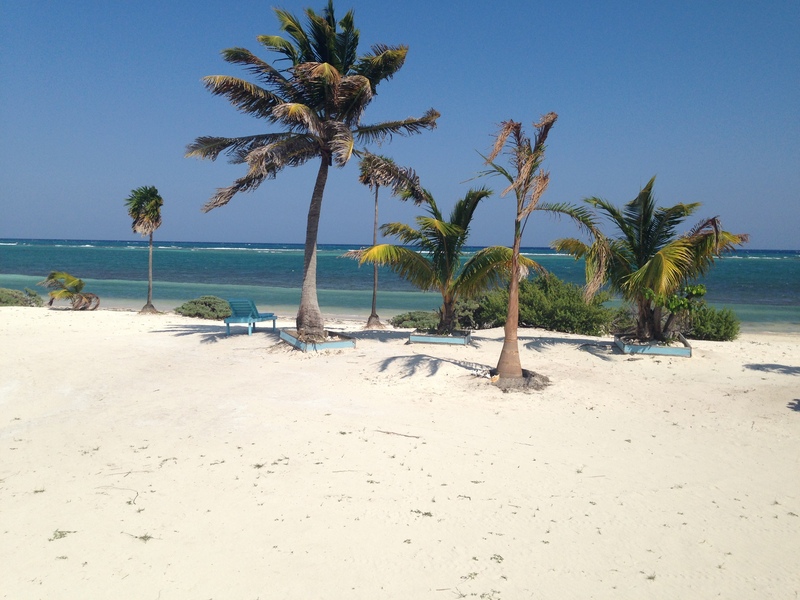 Don’t let this beautiful Belizean scene fool you. Plastic lurks out there. 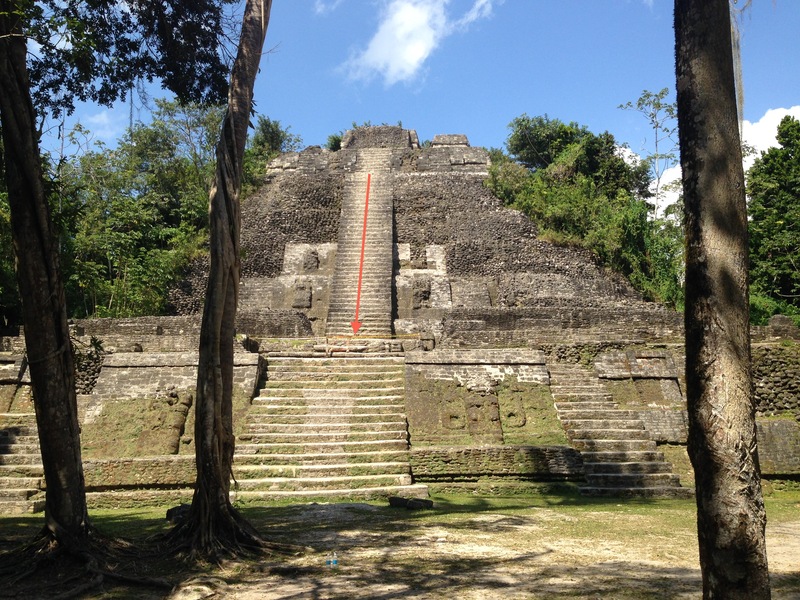 Part 2’s fascinating installment is about our day-long trek into the wild jungles to see the ancient Lamanai Mayan ruins in northern Belize. No one told me I needed to pack a machete. We hired a tour guide/driver to take us to the boat dock where we would then hop on a boat and go up river to the Mayan ruins. Our tour guide/driver was a wealth of information about Belize and it made the hour and a half drive pleasant, if you turned a blind eye to the evidence of poverty all around. The houses became sparse the farther we went into the countryside, but the unifying theme was laundry flapping on clotheslines in the Belizean breeze. I have to say this. Belizeans know how to keep their whites white. The driver pulled over to a collection of outbuildings that looked like they would collapse if you sneezed in their general direction. As it turned out, it was the put-in point for our boat ride to the ruins. I had my doubts about the wisdom of taking said trip at this point. But, a dozen or so not-insane looking people also waited to get on the boat to be sold up-river. Hey, I’m game. Or stupid. Pick one. Our jungle port of call. 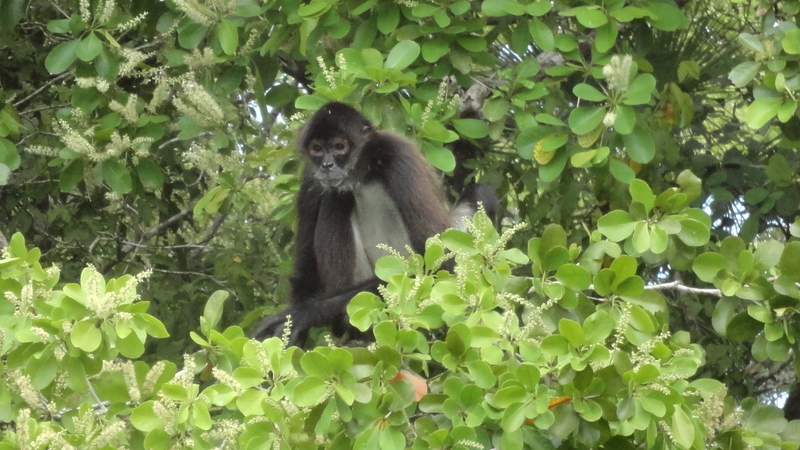 Our boat driver/Mayan ruin tour guide was charming and knowledgeable about the river’s flora and fauna. It was a tad disconcerting that the trip took us through crocodile-infested waters and under a tree canopy filled with snakes ready to pounce (can snakes pounce?) on us, bats looking batty while clinging to branches waiting for nightfall, and spider and howler monkeys up to their usual monkey business. The iguanas looked bored with the whole affair. Do you get the feeling we are being watched? It was like the Jungle Ride at Disneyland but the animals were real. Or like the movie African Queen. Or Apocalypse Now. Or Indiana Jones. The Lamanai site was home to the Mayans for 2,000 years until the civilization’s collapse. There are burial pyramids, ceremonial temples, and the remnants of the royal quarters. Only a mere fraction of the site has been excavated. A Canadian dude did two major digs, but without for funding the project, most of the site is still succumbed to the jungle. I’m not going to give you a lecture on the lost Mayan civilization. I’m no expert but I found the Mayan story fascinating. If you have a chance, look them up. They probably have a Facebook page. Our boat driver/tour guide led us on an hour-long hike through the jungle to the various ruins and promised we could climb up the tallest one, aptly named, High Temple. 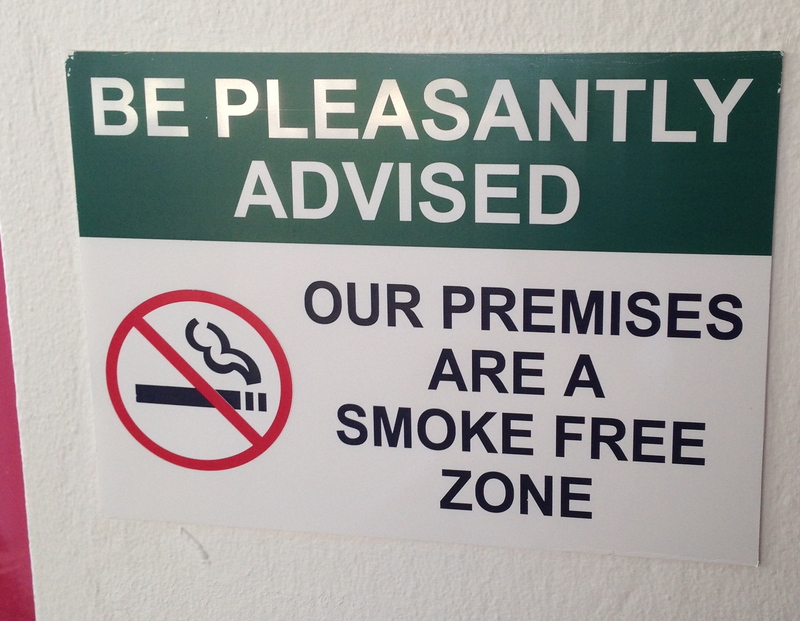 Those Belizeans are so clever. The arrow shows how far the woman fell. Climbing the pyramid was something my husband and I always wanted to do and we weren’t about to delete it off our bucket list while standing in the ruin’s shadow. It is hard to tell from the picture, but the side of the pyramid is precariously steep. They installed a rope to hang on to for dear life while scrambling up the side. While the steps look innocent enough, they are high and it is like doing vertical lunges while clinging to a flimsy rope. We made it to the top but my knees were shaking from the exertion as well as paralyzing fear. The top of the pyramid was too damn high for my liking and all I could think about was the poor woman who fell. I also swear a Mayan ghost was considering pushing me off the pyramid as a sacrifice to one of his virgin-loving gods. Then he realized I was the mother of three and backed off. Those aren’t ants on the ground. Those are people. I am haunted by the fate of the woman who fell and will let you know if I hear how she is doing. 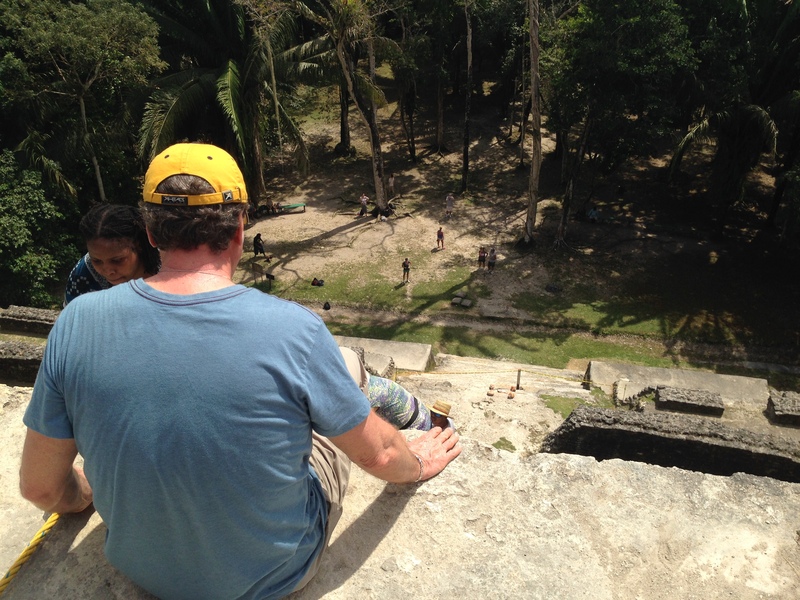 The tour guide fears the Belizean government will shut down the site or no longer allow tourists to climb the pyramids. Frankly, I am surprised you are allowed to even touch the pyramids. I guess they figure they have lasted this long, they ain’t going anywhere anytime soon. No, that is not a self-portrait of me carved in stone. My husband and I have been on a treadmill set at warp speed over the past year or more. Most of the life-workout has been wonderful and I’m not complaining . . . travel, family, adventure, etc. Some parts were not so good . 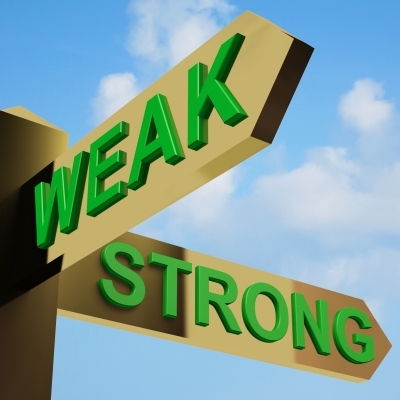 . . failing parents, the death of my uncle after his slow decline, and the sound of my writing coming to a screeching halt. We needed a time out. Big time. When we vacation, we usually cram every minute visiting landmarks and museums, walking our feet off, and savoring local food. We collapse at the end of the day and hit repeat the following morning. 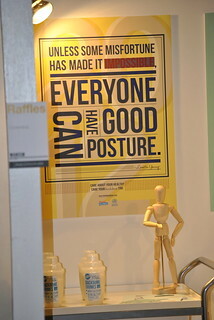 We aren’t sit-on-the-beach-and-contemplate-our-navels kind of people. After red-lining life for so long, we were in the mood for a vacation that included rum drinks with umbrellas in them, sandy beaches, sea breezes, and limited Internet. 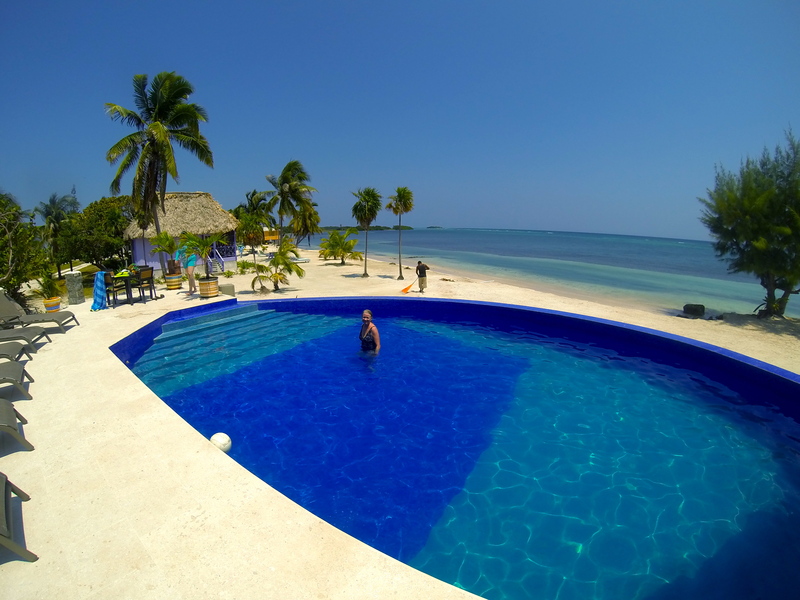 We considered Hawaii or Mexico, but while doing research on tropical destinations, I came across a resort situated on an atoll 25 miles off the coast of Belize. 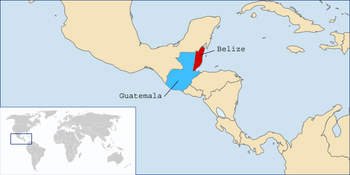 For those of you who are geographically challenged, Belize is on the east coast of Central America with Mexico to the north and Guatemala to the west and south. The sole resort on our vacation island boasts 18 private cabanas on a blindingly white beach, no television, radio, or paved roads, three meals provided daily, and world-class snorkeling and SCUBA diving out the front door. Think Gilligan’s Island with Internet access only available in the Skipper’s hut. Over the next few posts, I will do my best to not bore you with an endless slide show of the hundreds of pictures we took while in Belize. But first, not knowing a damn thing about the country of Belize, I did due diligence research (what did we do before the Internet?) and read some things that made me scratch my head. Did any of you guys know this stuff? Belize’s barrier reef is second only in size to Australia’s Great Barrier Reef. Who knew? Mr. Wick E. Pedia casually mentions that chewing gum was invented in Belize. Listen, buddy, you can’t drop that bombshell and not give us more details about the who, what, when, where, and how Belize came to be the birthplace of Bazooka Bubblegum. 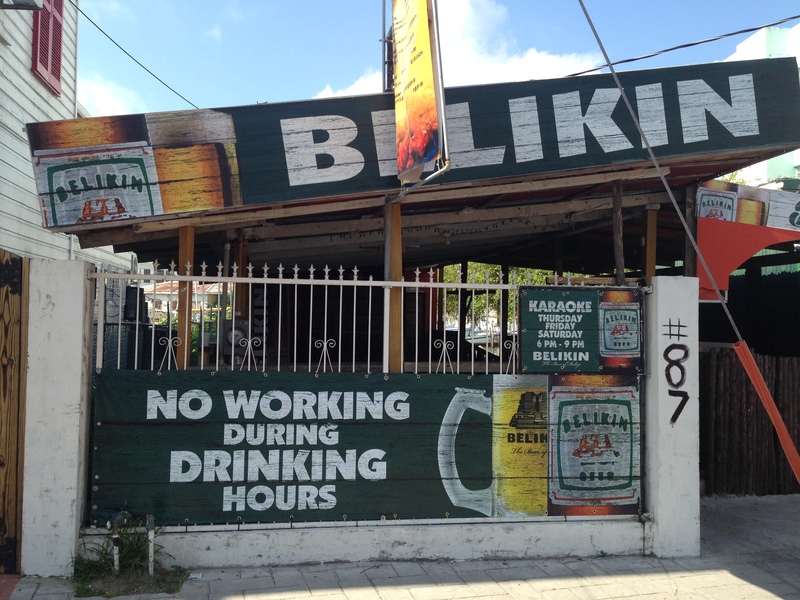 Belize City, the largest city in Belize, is little more than a slum. Actually, calling it a slum is an insult to the word slum. It is a pit. The ramshackle houses look abandoned until you notice the fresh laundry hanging on the line. Dozens of buildings are mere shells. Vacant lots are strewn with garbage and worse. Dental work appears to be an unheard of luxury. The abject poverty is sobering. 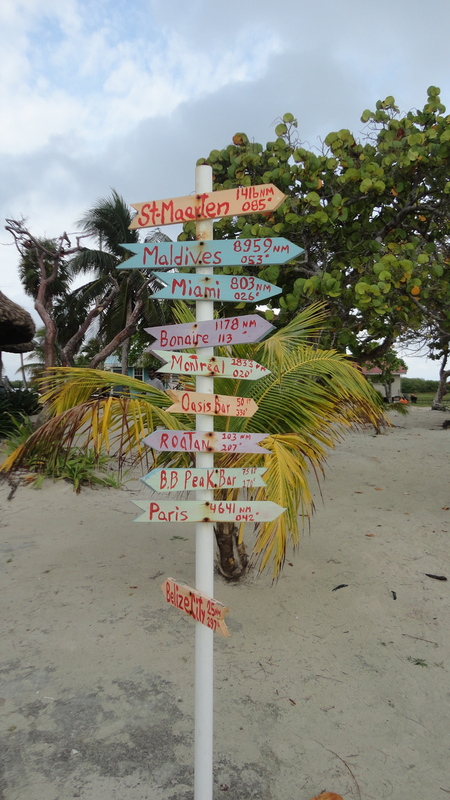 Fortunately, we were only in Belize City for one night before heading to our island paradise. In stark contrast to the poverty, the literacy rate is 77%. Local churches run the schools and the kids wear immaculate uniforms unique to their particular school. Belizeans may not have money for dental work, but they take a great deal of pride in their educational system and starched uniforms. A large population of Mennonite farmers settled in Belize because the government granted them freedom from religious persecution and exemption from military conscription. The Mennonites are the nation’s farmers, producing goods for the general population as well as for export. They pretty much stick to their farms, but we saw a few couples shopping at the pharmacy in Belize City. It was like the cast members from the movie The Witness made a wrong turn and landed in a ghetto. 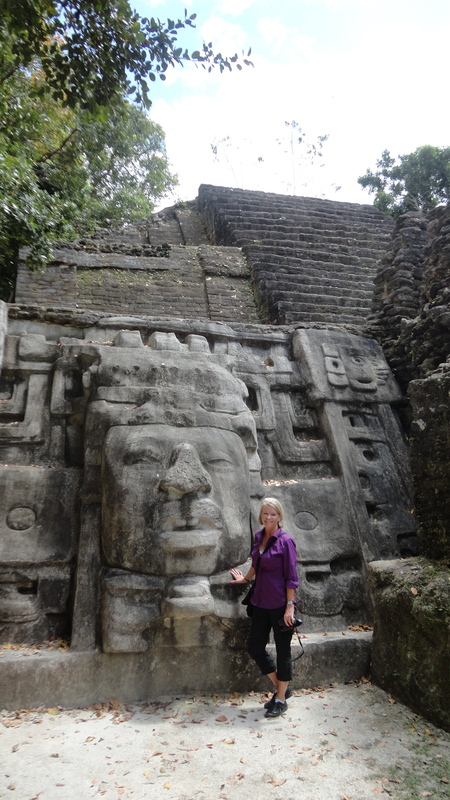 The country is rich in Mayan ruins dating back as early as 900 B.C. Archeologists estimate that at its peak, the Mayan population was one million. Keep in mind there are only 334,000 people living in Belize today. More on the Mayan ruins in a future post. 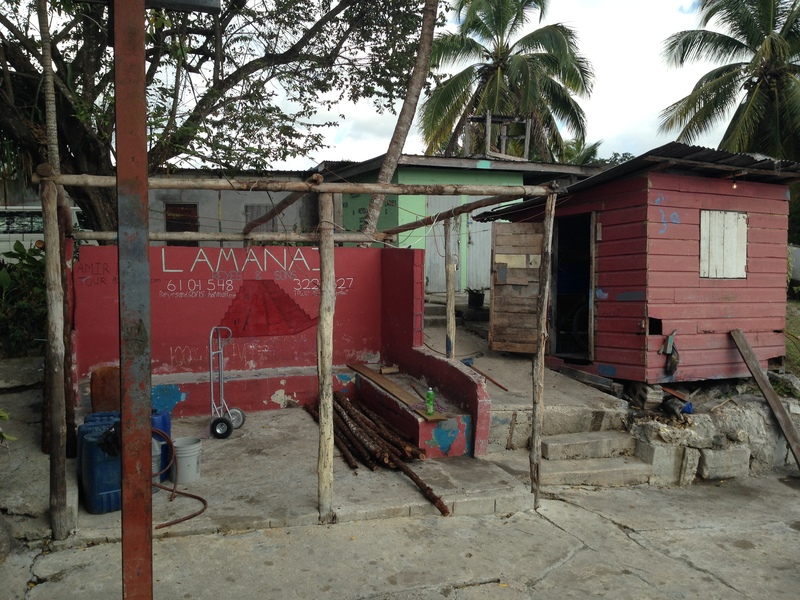 They may be poor, but the Belizean pride in their heritage, culture, and the country’s beautiful landscape is apparent. One last thing . . . Belizeans are warm and welcoming souls. Even with teeth in dire need of orthodontia, they have the most beautiful smiles. As a preview to future posts about our trip, here is a teaser photo of the view from our cabana. Who needs Internet when you have this . . . 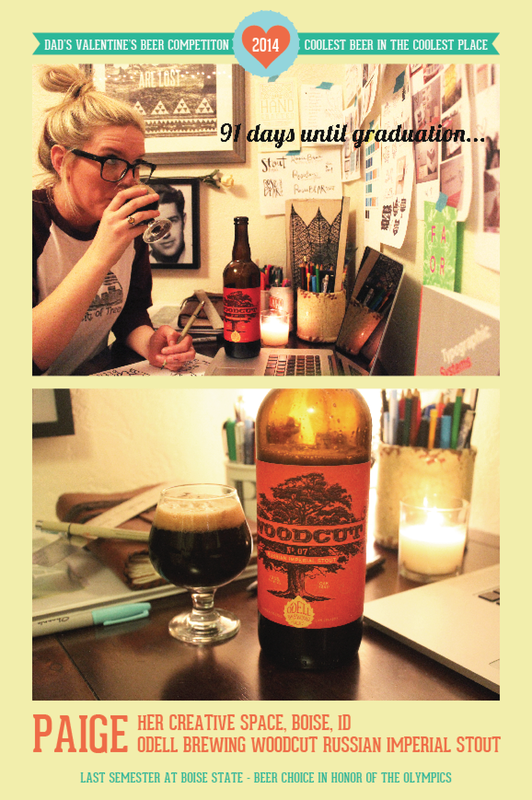 The ever so talented Paige Coyle, resident graphic designer, took the Valentine’s Day “Coolest Beer in the Coolest Place” contest entries and made them all fancy-like. I submit the photos for your consideration. For those of you who haven’t been playing along, shame on you, However, here is a recap of what the contest is all about. My husband gives each of our girls a wad of dough for Valentine’s Day and challenges them to buy an interesting beer and then take a photo of themselves drinking the beer in an unusual location. You lucky people get to vote on a winner. Maybe this is how we should do the presidential election from now on. I ask you . . . what is more democratic than a beer contest? We were in Newport Beach (Los Angeles area for you non-California-ites) in January and it was 80 degrees. Yes, I said January. Yes, I said 80 degrees. Sorry East Coast friends. My husband named his yacht you see over his shoulder, “Rockin’ Robin.” He is sentimental that way. 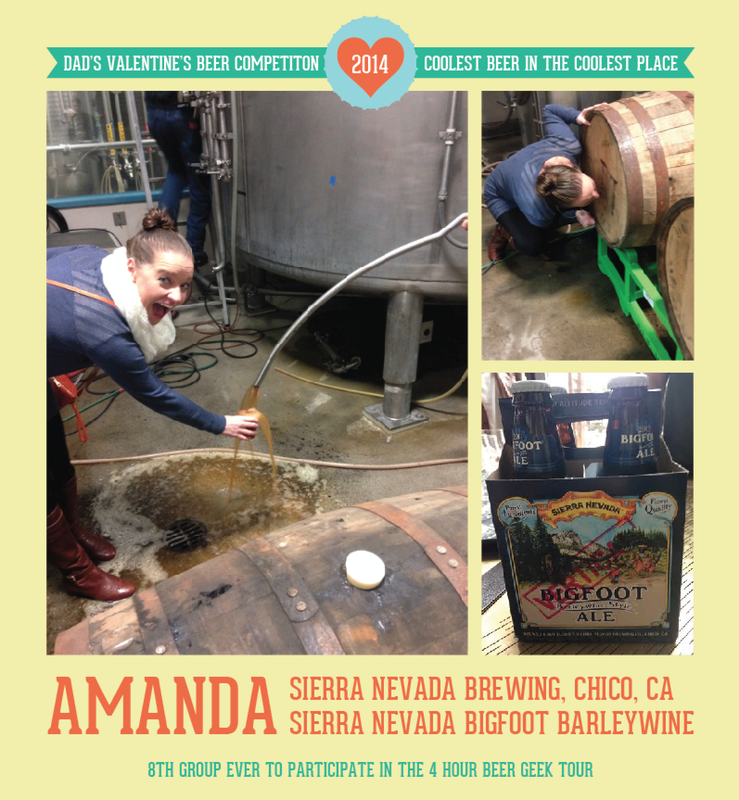 Amanda took a 4-hour beer geek tour of the Sierra Nevada brewery and when the staff found out about the contest, they pulled out all the stops (literally) for her and let her drink right out of the barrel. It is just like how she used to drink milk out of the carton when she lived at home. Jill lives in Colorado and in the dead of winter she was brave enough to don a bikini and trek through the snow to a natural hot spring. 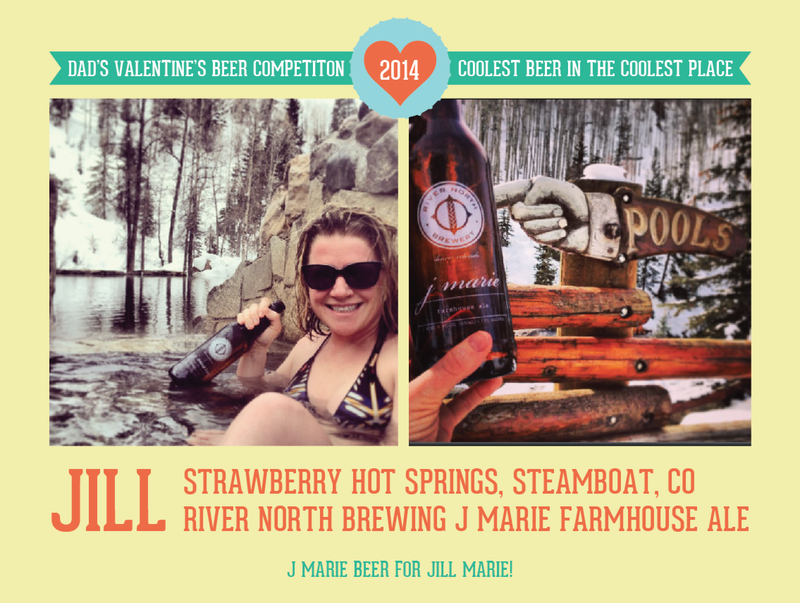 It should be noted that her name is Jill Marie and the beer she found was named J. Marie. Coincidence? I think not. Last but not least, Paige is in the final days of graphic design school before graduation. Needless to say, she is hog-tied to her computer while on the final stretch. But she has good company . . . a cold beer and our Uncle Mitchell watching over her while she does her work. For those of you who have read about my uncle, that is his photo over her shoulder. Okay, it is up to you folks. 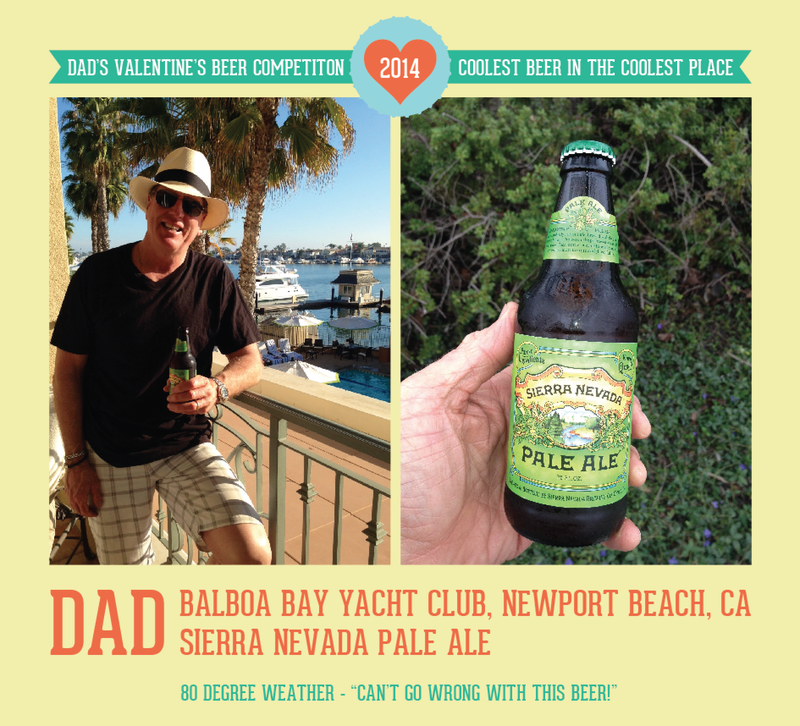 Vote for your favorite “Coolest Beer in the Coolest Place” photo! Well, yesterday, I did something completely outside of my comfort zone. I am a firm believer in not scuba diving. Why? I hold these truths to be self-evident. (Cue the music from Jaws.) A blockbuster movie star lives in the ocean and he was capable of eating Robert Shaw and turning Mr. Shaw’s fishing boat into splinters. Mr. Great W. Shark then used one of the splinters as a toothpick. A bevy of creepy things live in the ocean and their sole purpose on this planet is to sting, bite, or generally smother humans. Why swim with the fishes when you could be reading a book? So why, you ask, did I go scuba diving? I asked myself the same question. My husband and I are soon taking a much-needed break from the dreary 70 degree weather we have been having in California and are going to a resort on an atoll off the coast of Belize. My idea of a fun time in Belize is lollygagging in a hammock on the bungalow’s veranda with a cold beverage in one hand and a good book in the other. My husband’s idea of fun is being eaten alive by a creature of the deep. It is a wonder we ever thought we were compatible enough for marriage. The only reason I relented, in addition to the whole water torture thing, was I knew there isn’t enough time for me to get certified before we leave for our trip. About half of the 3-hour class was taken up with strapping 500 pounds of scuba equipment on our backs. Call me crazy, but it seems counterintuitive to weigh yourself down before going into the deep end. The indoor pool was 92 degrees and the consistency of used bath water. Smart girl that I am, before I dipped one toe into the pool, I checked for sharks in case the teacher wanted to give us a true feel for the scuba experience. We started in the shallow end of the pool, which is an excellent place to not drown. 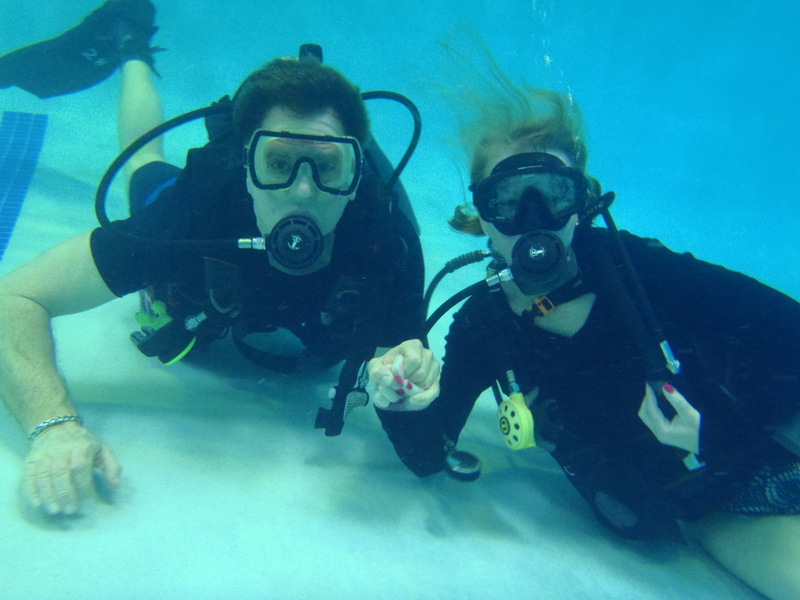 We practiced various maneuvers designed to keep you alive underwater. I was all ears for that. Once we mastered breathing underwater through the regulator (the mouthpiece thingy where you get your oxygen, that life-extending essential), filling our masks with water and clearing it out, and removing and replacing our regulators, the class set out to the deep end. I set out to the medium end and hung near the ladder. 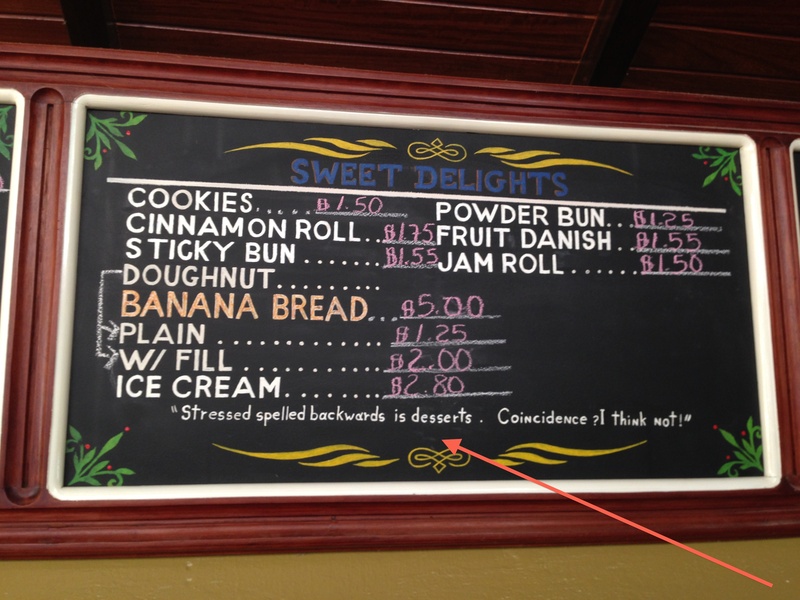 When the panic subsided, I discovered one very important thing. The bottom of a swimming pool is pretty boring. I think that is an evil trick of the dive school. They want you to sign up for more classes so you can learn to dive where the landscape is covered with creepy things that want to sting, bite, and generally smother you. I’ll be waving to my husband from the veranda, once I set down my cold beverage, that is. Valentine’s Day is upon us. How do I know that? 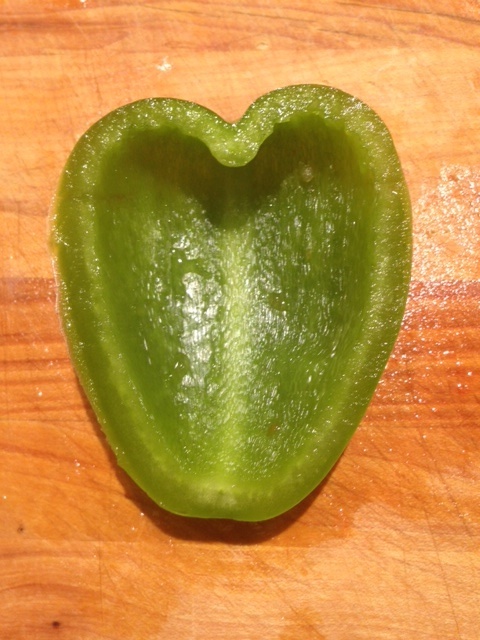 While I was making dinner last night, a bell pepper told me. Who knew oracles come in the form of vegetables. Be still my bell pepper heart. Many traditions and symbols are associated with Valentine’s Day . . . a naked flying baby who is armed to the teeth, giving tacky heart-shaped boxes filled with inedible chocolates that are more lard than cocoa, and gifts of red roses that cost more on Valentine’s Day than what it takes to run a developing country. Here at the Coyle house we have a long-standing Valentine’s Day tradition, and well folks; it is that time of year again. For the third year running (perhaps three years doesn’t exactly qualify for long-standing status . 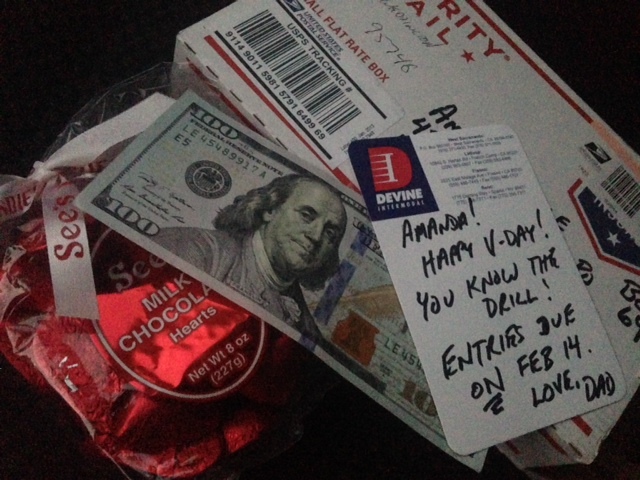 . . but my blog, my rules), my husband sends each of our girls a bag of See’s chocolate hearts, cold hard cash, and issues a challenge. Nothing says Happy Valentine’s Day better than a cutthroat competition. I will humbly submit the entries for your vote in a few days. This Valentine’s Day Beer Challenge is soon to go viral. Click on the links below to my previous brilliant posts and you will learn how to impress your friends by starting it in your community. If I do say so myself, I’m not the brilliant one . . . the competitors are. One final thought. What is up with the See’s Candy uniforms? 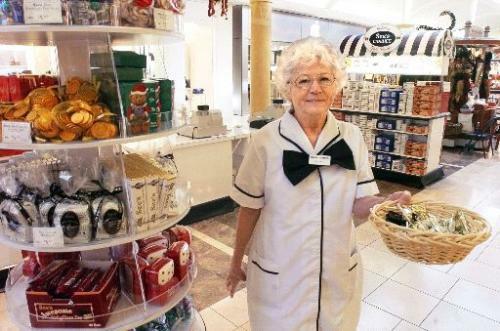 I couldn’t work at See’s because I don’t look good in a nurse uniform and bow tie. Robin, all ready for work! 250 Blog Posts, Beatlemania, and my Uncle are Somehow Related? This post marks two huge milestones . . . unlike anything seen before in our lifetime. 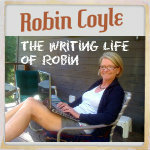 The first, which is sure to rock the world o’blogging, is that this is my 250th blog post. The second milestone is that 50 years ago today, The Beatles invaded the United States. No, silly, not a swarm of locusts, but those lovable mop-heads, John, Paul, George, and Ringo. They made their American debut on The Ed Sullivan show and once again the world was rocked. Not by one of my stellar blog posts, but by Beatlemania. Coincidence? I think not. Cue the music from the Twilight Zone. How could it be a coincidence that The Beatles’ most devoted fan hit 250 posts on such a momentous occasion? Well, it is rumored that they sang. No one really knows for sure if they belted out a tune or not, because screaming teenage girls drowned out every other sound with their histrionics. Old Eddy boy was screaming as well, and had to be revived with smelling salts. Back to me as an adorable kindergartener . . .
Oh, Dad. If you only knew what was in store for us in terms of radical rock stars. Think, Lady Gaga wearing a meat dress and Miley Cyrus twerking. Back to me as an adorable kindergartener and Uncle Mitchell’s visit . . .
Uncle Mitchell arrived wearing Beatle boots and I thought it was the coolest thing ever. You have to admit it was pretty cool. For those of us of a certain age (old), there is no need for a definition of Beatle boots. To humor those of a more tender age, The Beatles wore ankle-high boots with a side zipper, bit of a heel, and a pointed toe. In the 1960s, they were considered avant-garde and edgy. By today’s standards, they were about as tame as milquetoast. Uncle Mitchell passed away at age 93 in October. We were braced for it, but it was still a blow. His sense of humor, story-telling timing, and sharp wit was enchanting and wacky. He found joy in every moment, loved life, and it showed. It was contagious. If I could have just half of positive energy he exuded, I would consider myself a lucky girl. 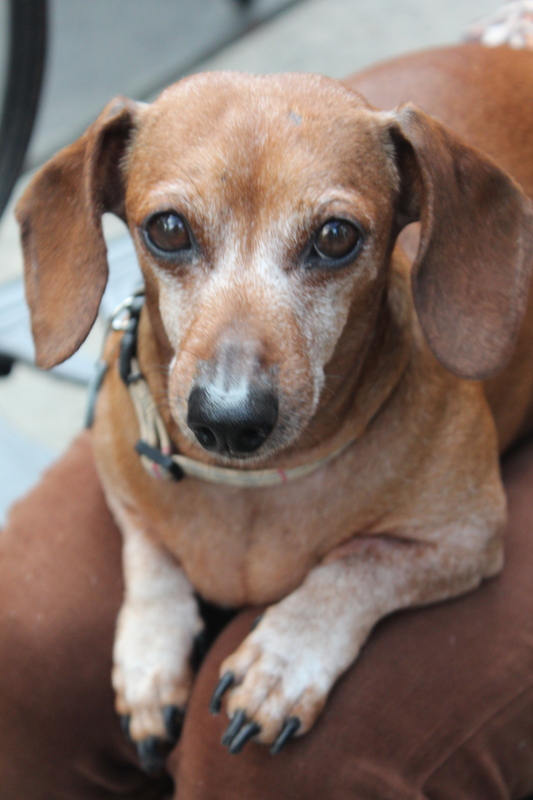 But in reality, where I feel most lucky is that he was a rich and colorful part of my life. 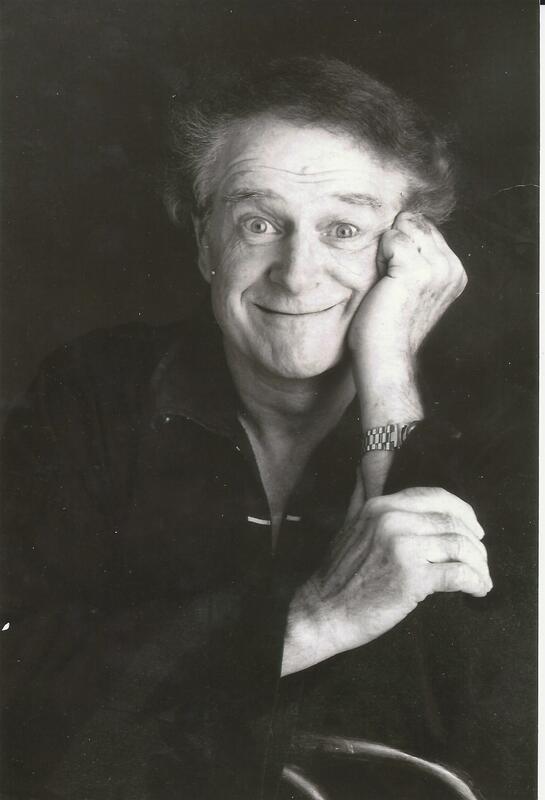 My uncle had a decades-long career on Broadway as an actor, director, playwright, and stage manager. He worked with some of the finest in the theater . . . Ian McKellen, Woody Allen, Tom Stoppard, Tony Randall, Maggie Smith, Al Pacino, and Tennessee Williams, to name only a few. 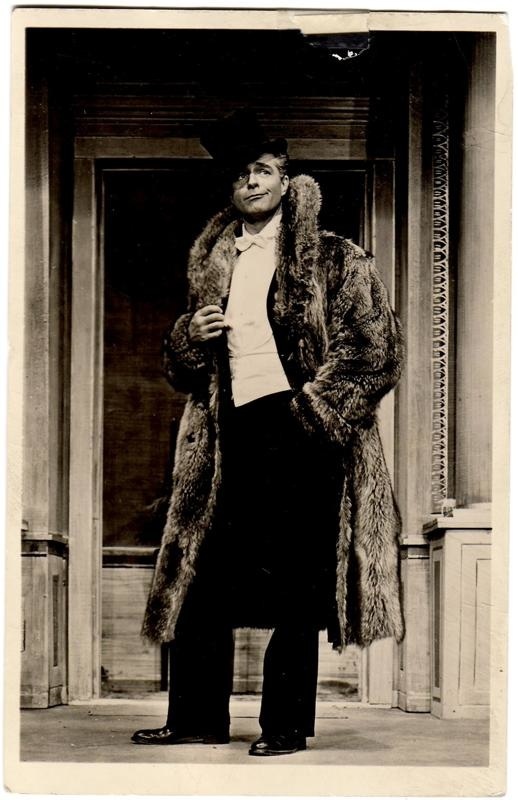 In his words, Uncle Mitchell was “born to theater, drama, and performing. That explains the Beatle boots. He had 10-minute conversation with a wrong number. So like Uncle Mitchell. So, in addition to this post being a tribute to my 250 posts of utter brilliance blather, and a salute to the band that changed the world of music, it is an overdue homage to my uncle. To borrow a line from the novel The Prince of Tides by Pat Conroy, “The only word for goodness is goodness, and it is not enough.” Uncle Mitchell was the coolest guy ever and life was his stage. Bravo, Uncle Mitchell. Encore. You too, Beatles. Not you, Robin. You should go sit down. Coolest uncle ever. See above. See below. My husband and I forked over half of the money in our Swiss bank account and purchased tickets to see the Eagles in concert at the Forum in Los Angeles. We wanted to see them in concert before they split up for good or kicked the bucket. I’ve been a fan of the Eagles for more years than I can count, and I can count pretty high. The soundtrack to my high school years is an Eagles playlist. Picture this: I’m 17-years old, my girlfriend and I are driving home from a day at the beach, and sand is stuck to our Bain de Soleil smeared skin. With the top down on my mom’s Mustang convertible, our bikini-clad nubile bodies turned heads while we cruised home. “Hotel California” was blasting from the car’s tape deck and we were singing our hearts out until people started throwing sharp objects at us. Ah . . . those were the days. The Eagles put on a great show and you almost forgot that they are senior citizens. But we were reminded of their advanced age when they took a 15-minute intermission for a restorative swig of Geritol and a light rub-down of Bengay. Gone are their days of a swig of Jack Daniels and rubbing cocaine on their gums during intermissions. The only disappointment about the concert was that they didn’t play my favorite song, “Desperado.” I think it was because they forgot the lyrics. You are never to old to rock out. During the intermission, a young girl (I’m guessing 10-years-old, or so) a few rows in front of us stole my heart. 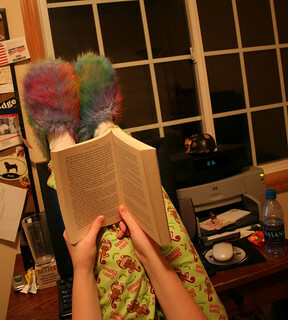 As soon as the house lights went up, she whipped out her book and began to read. 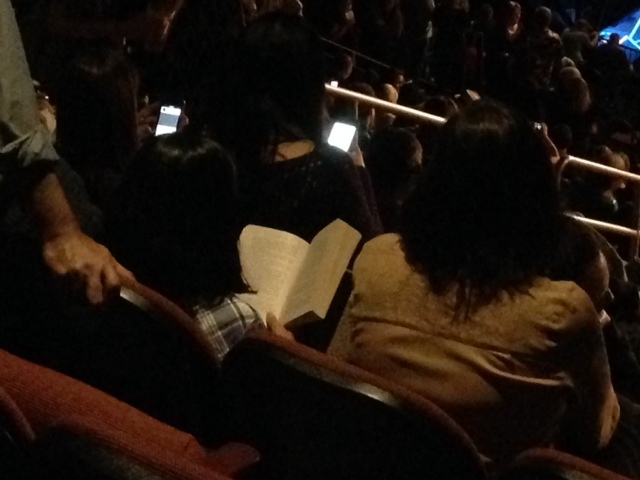 I was dying to ask her what she was reading. 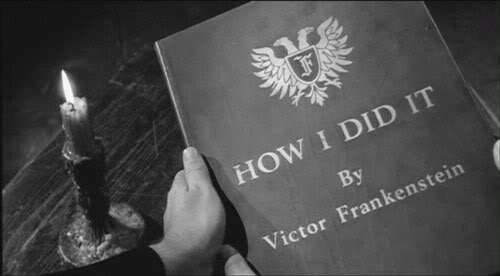 That, my friends, is an avid reader. ~That must be one good book! The ever rocking-rolling Eagles ended their encore with “Take it Easy.” The song is 42-years-old and the band may be pushing 70, but the song made a young girl put down her book and listen to greatness. It’s a girl, my Lord, in a flatbed Ford . . . slowin’ down to take a look at me. Hello my bloggery friends. Have you missed me? Well, of course you haven’t. Unlike me, you all have lives filled with adventure, fame, and own six-inch stilettos (of the shoe variety for women, knives for men . . . or perhaps it is visa versa). No time to waste thinking about Robin-Baby when you are busy sipping champagne and supping on canapés along the French Riviera, right? 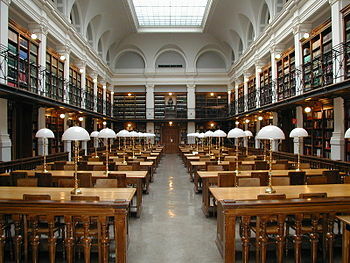 I am taking a break from blogging to focus on finishing my novel, In Search of Beef Stroganoff. So how’s the writing going, you ask? I’ve been preoccupied or distracted or unfocused, or all three. We’ve been traveling a great deal and concerns about my parents and uncle give me plenty of excuses to avoid my manuscript like one would avoid an outbreak of diphtheria. Pardon the interruption from your repast with Rockefellers, but a topic has been chewing on me and I feel the need talk to you about it. The topic is the burgeoning role social media is playing in our lives. 1. It is ironic that I am opining about social media on a social media platform. Don’t worry. This isn’t going to be a wild-eyed rant about the evils of social media. Nor it is an engraved invitation to a Social Media for Dummies book-burning party. 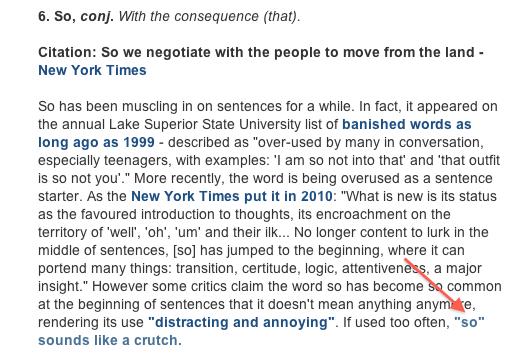 A series of events over the summer gave me pause and caused me ruminate (another dandy word). So, I got off my non-blogging arse to put a few thoughts before you. 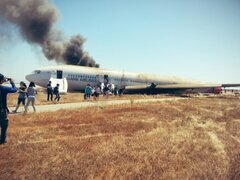 The Asiana plane crash at San Francisco International Airport was tragic and thank the stars more lives were not lost. One of the first images of the crash I saw on television was the photo taken by crash survivor David Eun of Samsung. Cell phone firmly in hand, he took an eerie photo of the burning and mangled wreckage on the tarmac and Tweeted it. If I were lucky enough to survive a plane crash, my first thought would NOT be to Tweet about it. Once I counted my fingers and toes and knew my loved ones were safe, I would rush to the aid of others. Whipping out my phone to take a photo after a near death experience would be the last thing on my mind. Surely there were people who needed a comforting arm put around them, help in locating their family members or friends, or medical assistance. Think . . . tourniquets fashioned out of belts in the aftermath of Boston Marathon bombing. In all fairness, maybe Mr. Eun performed CPR on a dozen passengers and THEN Tweeted out his photos. I somehow don’t think so. Several weeks ago, a flash flood triggered a mucky mudslide in Colorado and caught numerous drivers by surprise. One of the drivers had the presence of mind to know a good thing when it happens to him. From behind the steering wheel, the driver took a video while his car surfed the river of sludge. I think we can all agree that Anthony Weiner is a scosh too social with his media. I refuse to give him additional exposure by posting his sexts. National Public Radio host Scott Simon recently lost his beloved mother to cancer. I feel for the poor guy. Losing your mother is heart breaking, for sure. He was besieged with sadness and regret, yet he thought, “I know, I’ll Tweet about it.” Like a color commentator at a basketball game, he chronicled his mother’s last days on the earth via his Twitter account. Some call Mr. Simon’s Tweets a sweet tribute to his mom. I think it was an exploitive and insensitive move from a man hoping to boost NPR’s rating and his Twitter followers. How about this example from the stupid people files. A young man from a small town in California posted this on his Facebook page about his dog who defecated on his bed, “Anybody want her? She’s FREE. Pick her up today or she will be shot and stuck in a hole by 9 p.m.” The police showed up at his door. The dog was fine and the man said he did it because, “I like people’s reaction; I studied sociology, so I get a kick out of it.” Maybe he should go back to school and learn a thing or two hundred. Call me judgmental, if you will. Call me stuck in the Dark Ages. Call me maybe. Before you get in a kerfluffle, I know social media has played an important role in many acts of kindness, increased awareness about social issues, and outreach for people in need. I know. But I think something has gone awry that when people now witness a tragedy they think, “I gotta Facebook this.” One should pull out their phone in a crisis, but instead of Tweeting about it, they should call their mom. ‘Nuff said. Maybe this was a rant after all. Kindly step aside while I get off my soapbox. Be well, my friends. I’ll be back to annoying you with my blog posts with regularity soon.